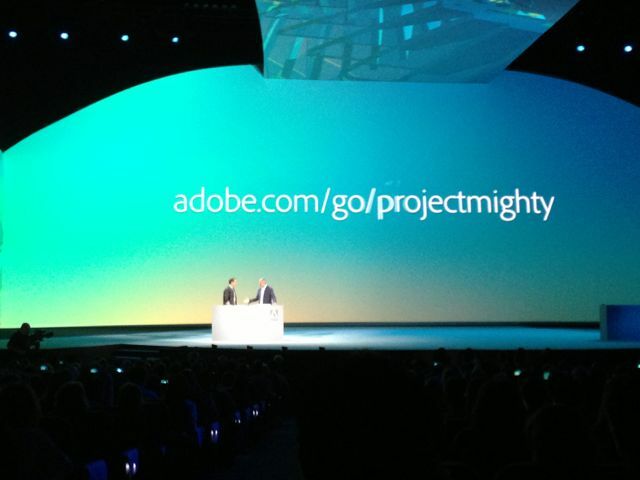 Monday at AdobeMax, breaking bounds and showing off by including TypeKit in the Cloud. 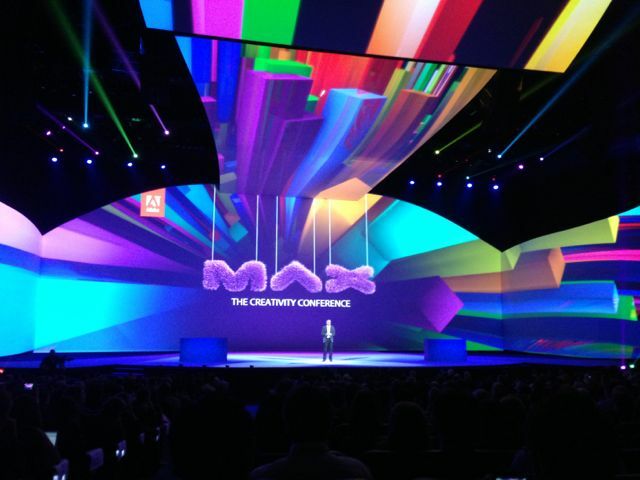 AdobeMax kicked off in the Nokia Theatre yesterday in a wildly colorful and often humorous presentations launching what we have been calling Adobe”Next” since it’s public announcement at NAB. So by now everyone knows that Adobe has abandoned the box in favor of the digital download format we all embrace on our phone and what Apple users were forced into using on their desktops a couple of years ago. Frankly I could not be happier, I am not harried by not having a disk and being connected is becoming more and more a part of our working and lifestyles. IMHO The CreativeCloud versions of Adobe’s product lines is only disconcerting if you are a pirate or live a non-connective lifestyle. 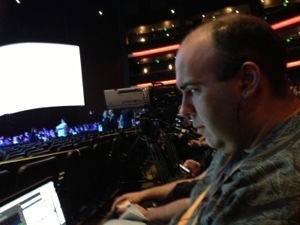 Rich Harrington cutting his audio podcast while waiting for the show to begin at the Nokia Theatre. I have been playing with a few of the soon to be released titles, with some of my tools becoming simpler to use, while others gained from their conversion. Photoshop’s ability to deal with “camera shake” looks as if it evolved from the wonderfully resourceful HDR toolset, while the added capabilities of direct accessing “CameraRaw” with a far greater level of control and adjustments. We have all seen sneak peaks at what is in AfterEffects, Premiere and Speedgrade, but the Photoshop and the announcement that Illustrator now has “Touch Type” while enabled for touch surfaces, Touch Type really astounded me by allowing full access to the full vector information in a single character without having to separate or break apart the word. Little surprised the audience at the Nokia Theatre more than the announcement of Project Mighty, a pen-based CreativeCloud connected device that can actually carry your preferences from device to device. Day 3 of AdobeMax covers the next generation of innovative genius that Adobe has kept offering us. I cannot wait for the sneak previews. Today Adobe kicks off their Adobe MAX event, where some of the industry’s best will be showing off the tools and techniques for creating all of the award winning content we see on the TV and the Web,as well as in print, packaging and social media. Also launching today in association Adobe and the AdobeMAX event is the http://www.CreativeCloudUser.com website that I have been working on with Rich Harrington, Robbie Carmen and Rod Harlan. Stay Tuned, it’s going to be a big week here.